“We could not find any evidence to substantiate your claim,” New Beginnings’ human resources director wrote in a letter closing the investigation. But Blouin-Williams conceded that an internal investigation did raise some smaller concerns about the network’s grading system and who has access to it. King doesn’t believe the network’s investigation was thorough enough and ignored the evidence he provided. He noted that in one case, he even saw a failing grade changed to a C.
“Seeing those grades inflated, at times two grade levels, was a red flag for me as a data expert,” he said. If true, the grade inflations could have an effect well beyond individual students at the 690-student high school in Gentilly. If grade changes allowed students to graduate, thus improving Kennedy’s graduation rate, that could also inflate the school’s state letter grade. Graduation rate accounts for a quarter of a school’s state rating. Kennedy is a publicly funded, privately run, charter school. Charter contract renewals are heavily based on a school’s state rating. In 2018, the school got a 30 on its assessment score, an F. That measure is based on state standardized test performance. But its graduation rate score was 84.9, a B. Overall, it was rated a C.
“It does have implications for the school performance score,” King said. King said he first realized something was wrong when he was meeting with the high school’s data manager in late January. He corroborated his account with an email sent January 28, from a counselor at the high school who said students noticed the changes. “I have been approached by several students stating that their final grades have been changed and they no longer have a failing grade in a course from Fall semester,” she wrote in an email to Kennedy’s Assistant Principal Taisha Payne. The changes they noticed were in Algebra III classes formerly taught by Gloria Love. Love left the school on Jan. 8 for personal reasons. She did not respond to repeated requests for comment on this story. King thinks Love’s algebra students were targeted for grade changes because she no longer worked at New Beginnings. “They changed her grades knowing that she would not have any knowledge of it, as an attempt to provide graduating seniors” with unearned class credits, he said. According to the Feb. 3 letter King wrote to New Beginnings’ HR Director Michael Washington, King informed Blouin-Williams and Kennedy Principal Brian Gibson about the apparent problem on Feb 1. He then called a technical support employee at PowerSchool, the electronic grade book used by New Beginnings. PowerSchool confirmed that the grades in the system did not match quarter 2 report card grades, which were originally published on Jan. 16. Blouin-Williams admitted that grades were changed. But she said the changes were the correction of a grade calculating error in PowerSchool. The error was related to how grades are weighted. In a weighted system, things like homework, testing, attendance and class participation each count for a certain portion of a students grades. She said all classes have a weighting system of 30 percent, 30 percent, 30 percent and 10 percent for various components of school work. But, she said for unknown reasons, Love’s Algebra III classes had weights of 25 percent for all four categories. When the proper weights were applied, Blouin-Williams said, the PowerSchool system changed the grades automatically. In two mid-March emails sent to Washington, Blouin-Williams and Gibson, Love disputed the changes. Blouin-Williams said the school has had issues with PowerSchool. “We’re having problems calibrating PowerSchool weights. Period,” Blouin-Williams said. A screen capture of one of New Beginnings\’ algebra teacher\’s classes. The red symbols denote a manual override for the final grade. Despite any issues, King told The Lens that Blouin-Williams’ explanation doesn’t make sense in this situation. First, he told The Lens it was his job to set the weights in all high school classes, and they were set correctly as of the Jan. 16 report card. Second, he said PowerSchool records indicate not every grade shifted due to the described “weighting issue.” If a grade was changed due to a weighting issue, all grades in the class would have shifted slightly. That didn’t happen in this case, he said. The Lens obtained screen shots of Love’s PowerSchool gradebook for the algebra class. 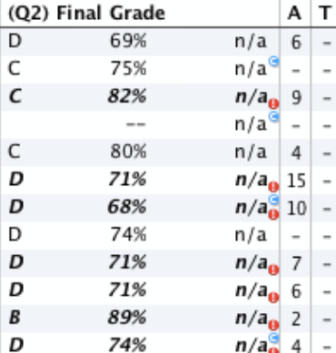 Small red exclamation marks appear next to several students’ grades. That is the symbol for a manual override. King said he presented New Beginnings’ human resources team mounds of evidence that employees manually changed grades. An investigation lasted about two weeks, from Feb. 1 to Feb. 15. It included 12 interviews, Washington said, including three with King. Blouin-Williams recused herself from the investigation. She said she acts as an arbitrator who votes up or down on administrators’ findings and recommendations. “Mr. Washington informed me that there were no findings even though I provided him direct evidence form PowerSchool that grades were manually modified,” King said. 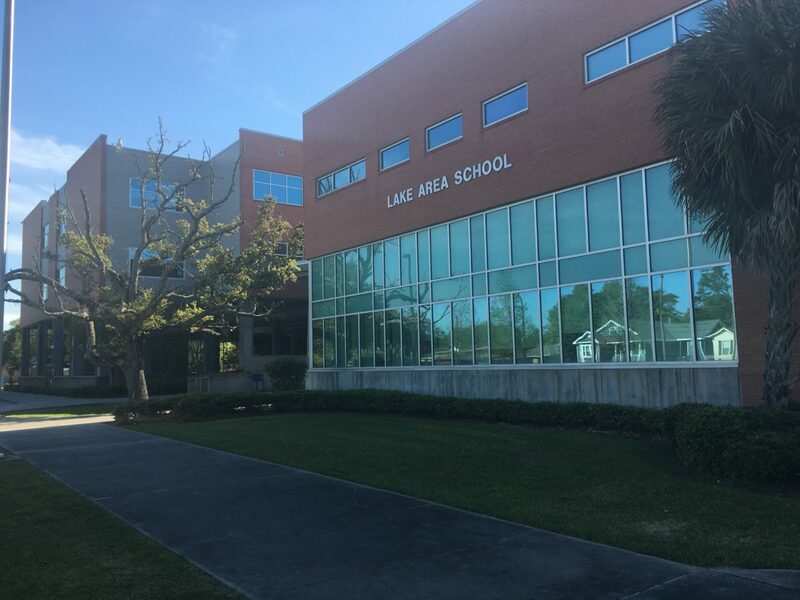 The school district also investigated after King emailed Superintendent Henderson Lewis Jr. and Orleans Parish School Board members. King said he spoke with Kelli Peterson at the central office. “She told me they met with New Beginnings and looked at the gradebook and the grades matched,” he said. In an interview Thursday, both Blouin-Williams and Washington said King’s claims didn’t hold up. They presented Love’s forest-green covered paper gradebook. “When you look at quarter two you can clearly see there are no F’s in this section,” Washington told The Lens. Love, however, disputed the lack of failing grades. In two emails last week, she pleaded with administrators to correct grades. “Put all original grades in PowerSchool, Q1, Q2 & Semester 1,” she wrote. Among the students she said that she failed were several with too many unexcused absences. Records show one student missed her class more than 40 times. Under school and state attendance policies, she wrote, those absences warranted failing grades, and that’s what she gave them. Blouin-Williams said they were still investigating that issue. “The first time we heard about that was last week,” Blouin-Williams, said regarding the absences. Additionally, King said he discovered someone logged in using a former employees credentials to change grades for students enrolled in Love’s Algebra class. King worked with PowerSchool and said he found that a former employee’s user ID had been used to change the grades. King wrote he had deactivated the ID in December, after the employee’s departure in November. The ID was used between Jan. 7 and Jan. 15, King wrote. The second quarter ended Dec. 20, according to the organization’s calendar. Asked about an ex-employee’s user ID being used, Blouin-Williams acknowledged it was an issue. She said they don’t know who had used it. Blouin-Williams said the investigation did lead to discipline for some employees. She said she could not identify the disciplined employees because it was a personnel issue. King helped with the grade change investigation for the first two weeks of February. But two weeks later, on Feb. 26, he was placed on a two-day suspension while the network conducted a separate investigation into missing ACT labels, labels that contain students’ names and ID numbers. The school accused King of mishandling the testing materials. He denies it, saying the labels were missing when he got them from the testing company. Two days later King said he called New Beginnings to see if he should come back to work. But he remained suspended through March 13, when he was called in for a meeting. At that meeting, he received a disciplinary letter, dated weeks earlier, about the closing of the investigation into the changed grades with no findings to substantiate his allegations. Further, the letter informed him, he was being disciplined for “failure to provide accurate data to support the allegation” Washington wrote. However, by the end of the meeting, King learned that his employment was no longer in jeopardy. He had already been fired. King thinks he’s being punished for raising the allegedly improper grade changing. But he said he felt it was his duty to alert the network, students and parents.